Thu., March 10, 2011, 12:29 p.m.
WILDLIFE -- An exotic furry critter resembling a cross between a beaver and a muskrat is gaining ground in the Pacific Northwest, and that's not something to get all warm and fuzzy about. The U.S. Fish and Wildlife Service released videos this week about thegrowing presence of non-native nutria in Oregon and Washington, two of 15 states with stable or increasing nutria populations. The invasive mammals, native to South America, cause ecological damage and are potentially harmful to native wildlife, native plants and potentially to humans. 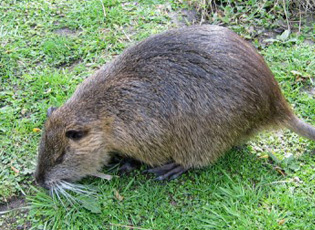 Nutria prosper in urban and suburban areas. Louisiana and Maryland are considered beyond eradication, a fate that could come true in the Pacific Northwest. Under the right conditions, biologists say, a breeding pair of nutria can lead to 16,000 offspring in three years. “Nutria are symbolic of many aquatic invasive species, in that they're often out-of-sight, out-of-mind and even frequently mistaken as native wildlife,” said Paul Heimowitz, the Service’s Pacific Region Aquatic Invasive Species Coordinator. into stream banks. In the future, climate change could increase nutria populations, whose range is currently limited by cold winter temperatures.